The story passed from grandfather to father to son, from grandmother to mother to daughter. It was handed down from a generation for which it was a living memory to one for which it was a cautionary tale to a third generation, born in this land, for which it was an injustice in need of an apology. In the early 1960s, when he was a boy of six or seven, Munmohan Singh Sihota remembers visiting the Sikh temple outside Duncan on a day when his father, a mill worker, told him an incredible tale. A boatload of immigrants from the Punjab, the father’s birthplace, had arrived in Vancouver harbour after an arduous voyage across the Pacific. They were refused permission to land. As days passed into weeks, conditions on board deteriorated. Water was in short supply, the food barely edible. The authorities, fearing an end to Canada as a “white man’s country,” ordered the ship to return to India. The passengers prevented the Japanese crew from lifting anchor. After eight weeks, a raiding party of 200 policemen and special constables tried to board the steamer, only to be beaten back. The next day, the navy cruiser Rainbow escorted the steamer out of the harbour. The boy would never forget the singsong name of the ship, Komagata Maru, nor the travails of its passengers — 340 Sikhs, 24 Muslims, 12 Hindus, all British subjects. The mere mention of the steamer brought to mind a photograph of the passengers with the beards and turbans of observant Sikhs. The boy grew up, earned a law degree, won a council seat in Esquimalt. In 1986, Moe Sihota became the first Indo-Canadian to be elected to a legislature in this country, a designation that did not mean much to him at the time. He raised the issue of the Komagata Maru in the Legislature. “I remember the political brouhaha,” he said. Mr. Sihota then asked the Socred tourism minister what had been prepared to commemorate the incident. Later, the minister would insist any commemoration would be the responsibility of private groups and not the government. Mr. Sihota felt a flash of anger, a memory that lingers. On Friday, the 94th anniversary of the vessel’s arrival, the atmosphere inside the Legislature was entirely different. The public gallery included descendants of the passengers forcibly expelled from Canada. Government House leader Michael de Jong introduced a motion apologizing for the events. 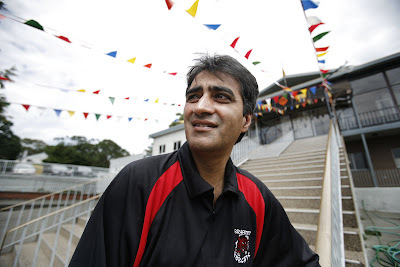 “They encountered racism and hatred,” Attorney-General Wally Oppal. “As they remained on ship, they were deprived of many of the necessities of life. Elected officials, members of the media and the public collectively fanned the flames of hatred. They cry of the day was that Canada was a white man’s country. As unimaginable as it would have been in 1914 to have a legislature in which members carry such venerable family names as Bains, Brar, Lali, Hayer, Chouhan. If the story had been passed from generation to generation in some communities, in other households it was ignored. Lorne Mayencourt admitted he had not known of what he called “this black mark on our history” until just a few years ago. The motion passed unanimously. The news made The Times of India and was carried by the Press Trust of India. The federal government is working on an apology, as well. Some commentators, notably Jeffrey Simpson in this newspaper, decry what they call an apology industry that seeks money for long-ago misdeeds. For Mr. Sihota, though, the simple act of apology carries significance. Mr. Sihota left electoral politics seven years ago, ending a controversial career that saw him twice resign and be reinstated to cabinet following conflict-of-interest investigations. Some saw him as brash, others as bold. His opponents called him a pit bull. These days, he appears on a CBC political panel, works as a consultant, owns a share of an Edmonton golf course, and is currently supervising the completion of a Sheraton hotel in Langford set to open next month. Whatever else he is and whatever else he does, he remains the son of a man from Barapind in the Punjab, who passed on to him an unforgettable story of tribulation. Mr. Sihota himself was born in 1955, just eight years after the franchise was restored to Indo-Canadians. (The right to vote had been taken away in 1907.) Raised in the Cowichan Valley, he had gone to university and like so many of his generation had joined one of the professions — law, education, civil service — from which his parents had been barred. He remembers on election night in 1986, as he prepared to speak to a raucous celebration at the Esquimalt Recreation Centre, looking at the faces of those standing against the walls. “They were all old-timers. They hadn’t been involved in my campaign, but I knew them from all different walks of life as I was growing up. “They were there to see something they didn’t think was ever going to happen” — an Indo-Canadian, one of their own, in the Legislature. More than 20 years later, after Mr. Sihota first raised the question of an apology, the story of the Komagata Maru has a new ending. On the fourth floor of a Victoria office building, a small crew spends long working days crunching numbers. They have figures for rainfall and for temperature and for water level and for snow water equivalent, which means the amount of water in a snowpack. Up in the mountains, a season's worth of snow has at last started to melt. The water will follow gravity to the mighty rivers that course through the province. The folks at the River Forecast Centre have the job of figuring out whether those rivers are likely to course through your bedroom. They have water on the brain at this time of year. This is freshet flood season. Allan Chapman, the centre's head, is on permanent duty, bad news just a pager's buzz away at any time of day. Or night. He and his crew have the awesome responsibility of issuing alerts about rising water levels. Given enough time, dikes can be reinforced and homes evacuated. But if the data are misread, or interpreted too late, the outcome can be far different. “We're not very good if we provide warnings after floods have happened,” he said, his humour dry in a way the province is not. Mr. Chapman worked all through the holiday weekend, issuing advisories and offering updates on the radio and through press releases. He took a few minutes yesterday to offer a tour of a grandly named workplace that consists of some cubicles and his tiny office, dominated by topographic maps of British Columbia. This was supposed to be a calm year, coming after record snowpacks in northern British Columbia in 2007. The snowpack was close to normal, which means it was neutral in the centre's parlance. No drought, no big flood risk. In April, though, the mercury seemed stuck. Warm weather did not come. It was one of the coolest Aprils in a century. Sunshine and warmth proved elusive in May, as well. The snowpack was not so neutral after all. The first melting took place on the Victoria Day weekend. The centre warned the public to be careful when rafting, fishing or camping. The water on many rivers was running fast and cold. On the Cowichan River, a young man from Mexico fell off a raft and could not be found after a two-day search. Mr. Chapman knows of one other drowning and notes another dozen people were saved in rescue operations. No search-and-rescue teams, more deaths. No River Forecast Centre, even more deaths. He can tally the fatalities from flooding in this province from memory. He knows what catastrophic damage can result from a major flood. He knows he'd better be correct when interpreting the data. “That's part of the weight we carry,” he said. Mr. Chapman, 53, grew up on a small farm where the western limits of Winnipeg met the prairie. He walked to school along a mud path beside a drainage ditch and would often build dams and otherwise play with running water. The 1950 Red River Flood was a common topic of conversation when he was growing up, so he was aware at a young age of the devastating power of a river spilling its banks. As he got older, he and his friends played along the banks of nearby Sturgeon Creek, where they caught crayfish and cavorted at water's edge. When he was 11, his best friend drowned in the creek, showing how even a pastoral idyll could be treacherous. He earned a science degree at the University of Winnipeg and a master's at Trent University in Peterborough, Ont. Prognostication is for soothsayers. These folks are scientists. The science of hydrology is complex, the equations mind-boggling. The crew at the centre – river forecast hydrologist Luanne Chew, snow survey specialist Janis Wright, snow instrumentation specialist Steve Corner, and a computer technician – are busy this week running numbers for an important snow bulletin update. These figures are reported by people who trek by snowmobile and snowshoe to isolated spots that house instruments in buildings looking like “wooden outhouses,” as one of the crew said, as well as by automated stations that beam information to the staff via satellite. These snow pillows, as they are called, are large rubber bladders filled with antifreeze. The pressure on the fluid is measured, giving a figure for the snow water equivalent at the location. Those numbers will determine what warnings will be issued, which officials alerted, which residents evacuated. In Prince George, a flood warning update for the Upper Fraser River was given yesterday morning. The river was expected to crest at about 9.55 metres after rising overnight. This morning, they will be looking at the numbers yet again. Ray Wiggins and Laura Funk entered the shop with heads bared. They exited topped by shiny new chapeaux. 'Tis May, a month in which rainy mornings give way to sunny afternoons, the warming weather an opportunity for waterlogged British Columbians to show themselves after too many weeks of damp hibernation. On Government Street yesterday, tourists strolled on a window-shopping parade. Some, enticed by a milliner's display, were soon preening in front of mirrors, running fingers along felt brims, tipping, topping and turning for just the right look. May is hat season. At the Kentucky Derby, aficionados of the sport of kings wear outlandish headgear, perhaps none quite as outrageous as the punter in a hard hat. Covered by roses, it featured two motorized horses rotating overhead. In England, Autumn Kelly, a commoner from suburban Montreal, married Peter Mark Andrew Phillips, who is 11th in line to the throne as Princess Anne's son. The newlywed couple rode away from the chapel at Windsor Castle in a horse-drawn Balmoral Sociable carriage driven by footmen in top hats. Other verdicts were not as kind to Bea. “When butterflies attack it can be ugly,” the tabloid Sun sneered. For an industry said to have been doomed a half-century ago by John Kennedy's choice to go hatless in the chill at his presidential inauguration, the hat biz is booming. 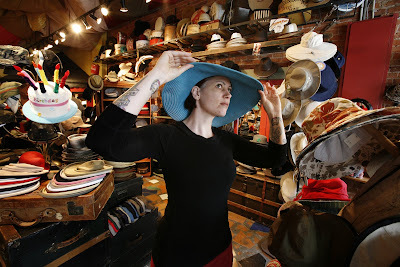 “The dressy element of hat-wearing turned people off,” Roberta Glennon acknowledged yesterday inside her eponymous hat shop. In the shop, you could hardly turn around without bumping a hat from a customer's head. These days, celebrities dictate the styles, whether it's Samuel Jackson in a flat cap, or Renée Zellweger in a flapper's cloche. Ms. Glennon follows the trends through image searches on Google. She constructed her first hats for friends in home economics class in Grade 7, and has been operating out of this storefront for 16 years, opening in anticipation of the 1994 Commonwealth Games. Victoria is a tourist town, but it also boasts a rich military history, complete with formal balls. An invitation to a shindig up at Government House may also require more formal gear than what one might wear to the Moss Street Paint-In. Those in the know also suggest a fine piece of millinery can earn a better table at formal tea at the Empress. Some customers are engaged in traditional activities of somewhat less formality. The dancers at Monty's Exotic Showroom Pub down the street are known to pop in to purchase props one imagines are chosen less for their stylishness than for their feathery promise. A portrait of the Queen overlooks the store, where an old television console serves as an aquarium. The shop is home to berets and bonnets, boaters and bowlers, panamas and porkpies, Rocky Balboa fedoras and Elmer Fudd hunting caps. A table is covered by Fidel caps, a cadet cap that remains in style even as its most famous wearer fades away. Little Peter Jones, a kindergarten pupil who turned 6 on Sunday, avoided the neighbouring toy store in favour of a rummage at Roberta's. He did not try on the jester's cap, or the pirate's tricorne, although he could not resist the hat shaped like a cake complete with candles. A hat can define the wearer, whether a Shriner in a fez or Sherlock Holmes in his deerstalker. Headwear can be a religious obligation, as in a yarmulke or a turban; it can signify high station, as in a papal mitre; it can be a workplace obligation, as in the labourer's hard hat; it can be just good common sense, as in the helmet for the hockey player. A tractor cap protects the face, but not the neck, of the sunburned farmer. The author Peter C. Newman has adopted a Greek fisherman's cap as a favoured prop to go with his pipe. Her companion left with a bush hat. Good choice. The new Indiana Jones movie opens in days. The wounded moan from beneath plastic sheets. They wait for help along the roadside, miserable in the rain. Other victims are trapped by the rubble of fallen buildings. The front page of this newspaper yesterday showed a man pinned like a butterfly in an entomologist's collection. One of his rescuers, holding aloft a bag of saline solution, stood atop the beam that pinched his right leg. No food. No water. No power. Little hope. Rob Johns studies these images of misery. Much can be learned from the aftermath of China's earthquake and in the wake of the cyclone and storm surge that devastated the country formerly known as Burma. He seeks inspiration from the horror. Mr. Johns, 41, is a family man whose calling it has become to prepare the British Columbia capital for such an eventuality. He is the city's master of disaster. Central China and coastal Myanmar are distant, but Victoria's emergency co-ordinator knows distress overseas might some day make our own tribulations easier. Some of us reach into our wallets when disaster strikes. Mr. Johns takes notes. He wants to know what works and, more importantly, what fails as emergency workers try to deliver aid. He could not help but overlay the damage he saw on the Gulf Coast onto a map of Vancouver Island. Imagine an area stretching from Parksville to Victoria, ranging inland as much as five kilometres, completely destroyed. That's what he saw. Mr. Johns came to emergency preparedness as a volunteer. In 1996, after the blizzard that paralyzed Victoria, he helped out as a radio operator. He even shovelled snow from roofs when senior citizens called for help. After nine years as a volunteer and eight as an emergency manager, he knows how important it is to prepare. 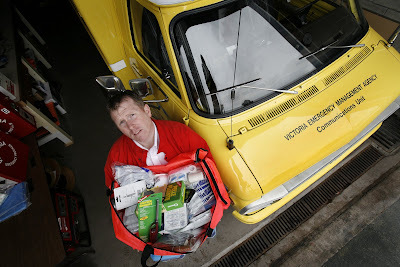 He has grab-and-go kits in his office at the Yates Street fire hall, as well as in his car. His home kit includes enough food and water to supply himself, his wife and their eight-month-old daughter for more than a week. He has not forgotten to supply their cat and dog. Mr. Johns lives day to day in a different fashion than the rest of us. A pyramid of boxes at the grocer is a reminder that more earthquake injuries are suffered from objects falling on people than from buildings collapsing. Even a near miss provides a lesson. Seattle school officials were pleased many of their students ducked beneath their desks when an earthquake rattled the region four years ago. They had been taught to “drop, cover and hold.” Some forgot the last bit, however, and wound up exposed as their desks jiggled away. Many of us feel immune. Why? He encourages people to stock supplies and to make themselves familiar with the resources offered by the city. The city also sponsors regular workshops. Sometimes, the sessions attract as few as a half-dozen citizens. The one scheduled for last night at the Burnside-Gorge Community Centre had 35 names on the sign-up sheet. Misery begets company. Bad news overseas today may save lives here in the future. The Komagata Maru is in the news this week, as the federal government prepares to offer apologies for the treatment of passengers turned away from British Columbia waters 94 years ago. The Japanese steamer arrived at Vancouver harbour on May 23, 1914, with a load of immigrants, most of them Sikhs. Officials refused to allow most of the passengers to disembark and the boat remained anchored as conditions deteriorated. The arrival of a naval cruiser finally forced its departure after an eight-week standoff. Hard feelings culminated in the assassination of a man who had spied on local Sikhs. He was gunned down in the halls of the courthouse in October. Bhai Mewa Singh was hanged for the murder on Jan. 11, 1915. He is still regarded as a martyr in the Sikh community. A forgotten part of the Komagata Maru episode is the role played by an immigration inspector named Frederick Wellington Taylor, who was one of the officials who barred the passengers. Fred Taylor was more familiar to hockey fans as Cyclone. Two months after the execution, his Vancouver Millionaires won the Stanley Cup. The city hasn't reclaimed hockey's storied trophy in all the years since. Eswyn Ellinor came home on wartime leave to her parent's village in the south of England. It was February, 1943. The Second World War raged into what would be its fourth year. Eswyn was just 19, three years of business college in her head, the navy blue uniform of the Women's Royal Naval Service making her a Wren. Her mother was pleased she had brought her ration book. “We've got a Canadian guest,” her mother announced. Her father, who owned the tobacconist's shop in Aldwick, had been a dispatch rider in the Great War. He had come to know many Canadians on the Western Front, enjoying their friendship and admiring their fighting spirit. It became his habit to invite young Canucks to Sunday dinner. “He thought they were wonderful chaps,” she said. At the dinner table was a smiling William (“Call me Bill”) Lyster, a strapping young man from the ranch country village of Empress, on the Alberta side of the boundary with Saskatchewan. “I thought he was very impressive,” she recalled, a hint of the Mother Country still on her tongue. An ocean, a continent and more than six decades later, she ticks off the qualities of a handsome Prairie lad. Their courtship lasted six months. They went to the big city for their honeymoon, the fireworks provided courtesy of German bombers. “Of all the crazy things, we went to London and we were bombed frequently. Being young we didn't take much notice. In time, the new Mrs. Lyster would leave her homeland for a new life in an unknown land. This Mother's Day weekend, she will leave her home at Qualicum Beach to visit the Royal B.C. Museum in Victoria. On the third floor, she will see her portrait on display with those of 79 others as part of a new exhibit titled, War Brides: One-Way Passage. The work, also featuring 800 photographs and multimedia installations, is the work of Calgary artist Bev Tosh. Ms. Tosh has spent the past seven years painting and recording the stories of women from her mother's generation. 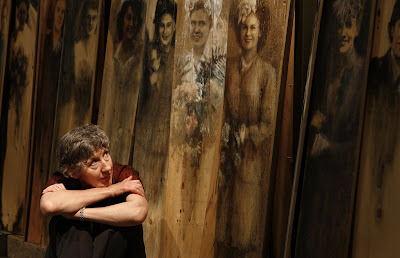 The artist began the portrait of her mother as an 80th birthday gift. The project has since expanded into a show exhibited in six provinces. Mrs. Lyster nearly lost her husband in the closing days of the war. He had earlier survived the raid on Dieppe before they had met, earning a “Mentioned in Dispatches” after shooting down a German plane with the anti-aircraft gun on their landing craft. He was filling in for a wounded (or perhaps killed) navy gunner. On April 24, 1945, he suffered a grievous chest wound, losing much of his right shoulder. The war in Europe ended two weeks later. He returned to Canada on a hospital ship, followed later by his bride and son. They arrived at Halifax with a boatload of other women and children aboard HMS Mauritania. A transcontinental trip by train ended at Swift Current, Sask., where her husband met her on the platform despite being encased in an upper-body cast. Mrs. Lyster greeted the older woman who accompanied her husband with a hearty, “Hello, Mother, I'm so glad to meet you.” It was not her mother-in-law, but her sister-in-law, who had a sense of humour and laughed off the gaffe. The Department of Veterans Affairs placed her husband in a labourer's position at a bakery, where he had to move barrels of lard, a rather cruel task for a man with so serious a war wound. He ended up as a sales manager, later working as a manufacturer's representative. The couple had a daughter and another son, lived in Edmonton and Vancouver before retiring to a home with a sea view on Vancouver Island. Bill Lyster died in December, 1996. Mrs. Lyster has completed a book about the war-bride experience, which she hopes to self-publish later this year. She is excited about the prospect of seeing Ms. Tosh's portrait, which her daughter and granddaughter viewed at an earlier exhibition. Yesterday, the artist and assistants were installing the pieces for the Friday opening. Most of the portraits have been painted on unsanded plywood, the panels leaning on one another in a symbolic show of support. The brides are identified only by their given names and some come with captions telling some of their story. One of them, Elly, a Dutch bride, had been married in a suit tailored from a U.S. Army blanket. Two cousins married Newfoundlanders in a double wedding the day before D-Day. The organ was drowned out by the roar of military vehicles headed to the coast. The artist will be placing a white rose in front of one of her portraits. Winnifred May Jones, born in Tonbridge, Kent, immigrated to Canada as a war bride in 1946, raised a family here, outlived her husband, and died last week before what would have been her 90th birthday. She had yet to see her painting in person and had been looking forward to the encounter. Instead, museum patrons will be able to pay their respects to one of many who bravely, foolhardily and, in so many cases, lovingly left all they knew behind for an unpredictable adventure.